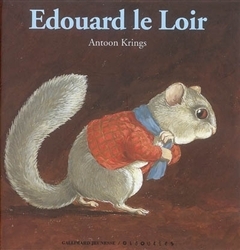 From Antoon Krings' successful series Drôles de Petites Bêtes comes this tale about a dormouse who, once woken from his winter slumber, can't get back to sleep. Benjamin the elf is responsable for waking him, so now Benjamin must figure out how to help Edouard sleep once more. As a non-native French speaker I sometimes find that the books in this series are a little text-heavy and grammatically challenging to follow, but this story in particular is a lovely, comprehensible and charming winter's tale.